I am so pleased I stumbled across this website. I was born in Bushey (Bushey Hall Road in a house next to Watford Technical High School) in the 1960s and moved several times in Watford. My childhood was mainly spent at 99 Queens Road, Watford and I remember walking with my mum up Queens Road to the High Street. In Queens Road, right at the start of the shops, you had the Corner Shop which was run by Bert and his assistant Nancy. Bert also ran a dolls hospital here and I often took my dolls to him to be repaired though was rather upset when he changed the colour of one of my dolls eyes from blue to brown because he didn’t have any brown eyes in stock! I must have been around 5 then. Just across the road you had Clarks, run by Mr and Mrs Clark. This was a Tobacconists/sweet shop and you could buy loose tobacco that Mr Clark would weigh on his scales. The Victoria Tavern was just before Clarks. There was a launderette next to what must have been the first Indian general stores. I hated the smell of the spices as a child going past that shop and would run past it holding my nose and breath! There was a coblers opposite run by Mr Malone who walked with a very pronounced limp – his wife Mary worked in the launderette. There was Carrs second hand shop, Symbols, Dunns Wallpaper and my very favourite shop of all, Ivor Newman’s pet shop. He moved his shop from one side of the road to the other. He always had puppies for sale in the front window and I loved going in there and picking them up for a cuddle! He also had a talking parrot that I had the most extraordinary conversations with. I can just about remember the Congregational Church on the corner being knocked down, where Allied Carpets were sited. Grevilles Photographers were on the opposite corner and a Dairy Shop opposite that with a lady serving with white hair in a bun and always wearing a pinafore. 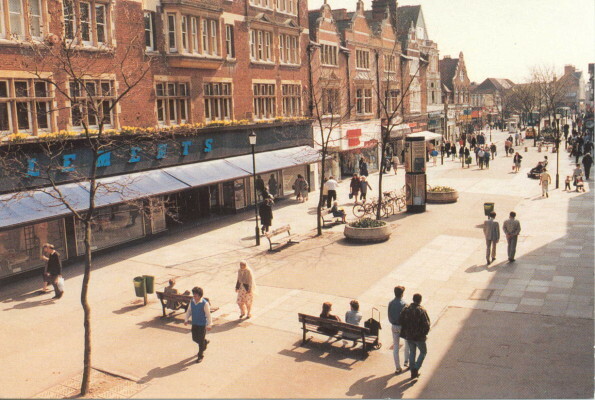 Trewins, a charity shop, a toy shop and then, turning left into Lower High Street was my favourite, Fantos. I loved this old shop with wooden floors and would make a bee-line for the toy department upstairs. I’m pretty sure that Boots was on the corner. At the top end of town I loved the chips from Sea Pride fish and chip shop, next to Peter Spiveys. Clements was a favourite especially at Christmas when they had a fake train ride for the children to see Father Christmas. I really felt we were on a long journey and then saw Father Christmas in his own ‘home’, wow! I’d sit on Father Christmas’s lap and tell him everything I wanted for Christmas and go home with my present and a competion entry form which was a picture you had to colour in and put your age on. Loved Cawdells, which had two entrances, one at the front and one in the side opposite the market. A little tobacconists opposite was where my dad used to buy his pipes. Christmas pantos at the Palace Theatre where I went with the school and the sweet shop opposite that sold lovely sherbet lemons. The Palace Theatre used to have wooden phone boxes inside the foyer with sliding doors exactly the same as they had at Watford Junction. Watford Junction, mmmmm, the smell that used to waft across the front from the cafe was luvverly, I can still remember it now. Opposite the Junction in Woodford Road, you could get the 142 and the 258 to London and the small single decker green bus to Two Waters Garage in Hemel Hempstead. Does anybody remember Technical Designs? Does anybody remember a firm in Woodford Road called Technical Designs? Know as TD, my mum used to work there and I’d walk down Queens Road with my toys to meet her from work. Completely unaccompanied, you couldn’t do that now, could you? This page was added on 26/07/2010. Does anyone remember a boutique in Queens Road called Orange Hand? I recall Clements. I was born in 1961. At Xmas the whole top floor in late 1960s and early 70s Clements, which at any other time of year would eb mostly furniture/ Beds became a Mahoosive toy shop with everything I could ever want. I spent my days milling round it in the Xmas school break, dreaming of my Xmas present which was surely going to coem from there anyway. There was another toy shop (proper), I think in North Watford soemwhere but i can’t recall where. Family from Watford - Can you help?